During the time of Sathya Sai Baba’s 70th birthday celebrations and thereafter, my wife and I met diverse devotees in Prashanthi Nilayam, Brindavan and Bangalore. Our host in Bangalore, Mr. V. Ramnath (‘Ramu’) of the IAS, was a friend of the Sathya Sai Central Trust, Mr., Prasad of Bangalore. He had been invited to a private dinner by Mr. Prasad and family at their home, at which they wanted Sai Baba to bless their son to begin his university education in the U.S.A. It was a sumptuous meal, Baba served by the son, and he ate heartily of all the dishes, according to Ramu. He blessed the son too, but only to take an education in India! Mr. Prasad had told Ramu a number of stories about Sai Baba, which he relayed to us. A scan of some of my notes from those days recounts some interesting claims. At that time I believed Sai Baba’s assurances, that the Board Members of the Central Trust were impeccable servitors and totally honest person. Since then I have learned a great deal about several of them who are known to be as corrupt as the majority of Indian officials are. 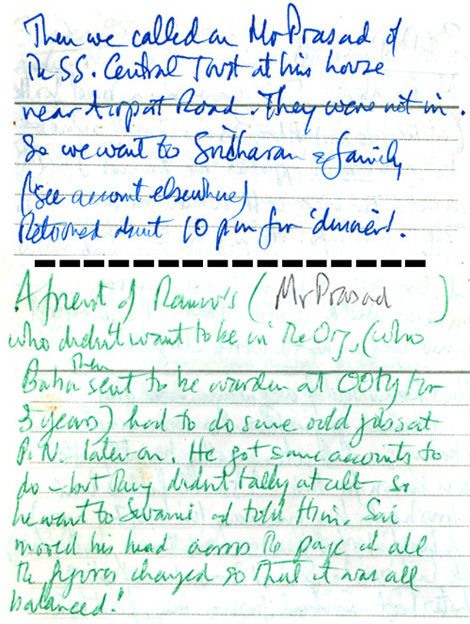 Transcript: A friend of Ramu’s (Mr. Prasad) who didn’t want to be in the Org., (who Baba then sent to be a warden at Ooty for 3 years) had to do some odd jobs at P.N. later on. He got some accounts to do – but they didn’t tally at all – so he went to Swami and told him. Sai moved his hand across the page and all the figures changed so that it was all balanced! This entry was posted on December 18, 2011 at 11:16 pm	and is filed under Sathya Sai Baba. You can follow any responses to this entry through the RSS 2.0 feed. You can leave a response, or trackback from your own site.